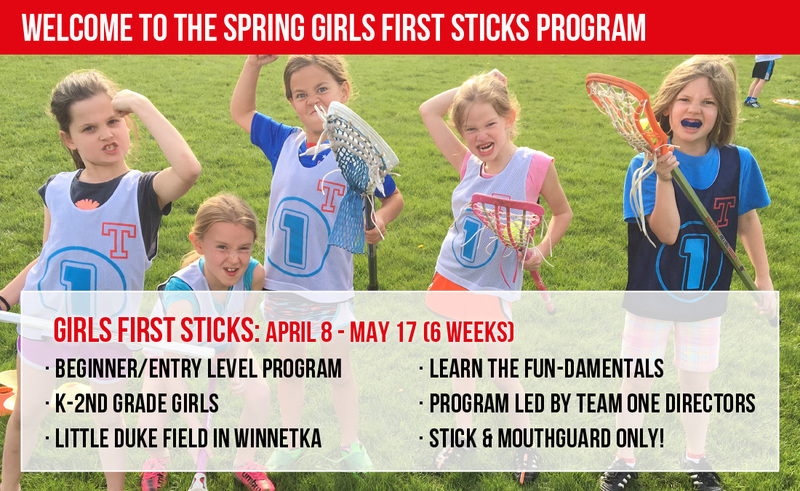 First Sticks is an entry level program perfect for Kindergarten - 2nd Grade Girls looking to learn the fundamentals of girls lacrosse in a fun training environment. Now with practice locations in Winnetka & Northfield, there is no better place to start your lacrosse career than the First Sticks Program. This program is recommended for players with Beginner/Entry Level Experience. Girls First Sticks is an entry level program based around a girl specific curriculum intended to teach players the fundamentals of girls lacrosse while allowing them to play alongside other lacrosse players in a fun and safe environment! Have fun learning the fundamentals of girls lacrosse, by learning the core principles of lacrosse in a very safe and structured training environment! Age and girl specific curriculum - a proven way to learn the game! Team ONE Girl Directors run the program! CLICK HERE TO REGISTER FOR 2019 SPRING BOYS FIRST STICKS!